The JM Internet Group announces that its list of the best SEO conferences has garnered 'featured snippet' status on Google for various key searches. The list is a popular goto resource among business marketers. Featured snippets are a new feature on Google for quick answers to common questions. The JM Internet Group (https://www.jm-seo.org/), a leader in books on SEO, Social Media Marketing, and AdWords for small business owners and marketers, is proud to announce that its updated and popular list of the best conferences on Search Engine Optimization for 2018 has garnered "feature snippet" status for some key searches on Google. Google awards "feature snippet" status when its algorithm determines that a web page constitutes the best answer to a common question or query. "Many small business marketers look for the best conferences in SEO and may find one or two of the conference websites," explained Jason McDonald, Director of the JM Internet Group. 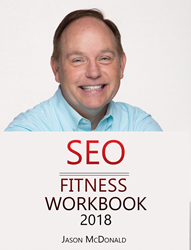 "However, in our work on the just published SEO Fitness Workbook 2018, we realized that there wasn't really an up-to-date list of conferences nor one that easily fit Google's need for the so-called featured snippets." To view the list of SEO conferences, visit https://www.jm-seo.org/2016/08/seo-conferences/. Each conference is described and rated with a link to the conference itself. Persons interested in submitting a conference to the list can also do so at the link stated above. To view a sample search on Google that generates the "featured snippet," visit https://goo.gl/1uNTz2. Please note that featured snippets do not always appear, so any person interested may need to try several search combinations of SEO, conferences, best, and 2018 to see the featured snippet appear. The mantra of the JM Internet Group is to "never stop learning." As part of this, the Group publishes books on SEO, social media marketing, and AdWords advertising aimed at small business owners and marketers. Each book contains worksheets, quizzes, videos, and other step-by-step instructions. Each book also contains a companion toolbook that identifies the best resources in each industry segment. As part of the toolbook, the JM Internet Group researches and identifies learning resources that include other books on the topic, tutorials, and conferences. The current list of the best conferences on SEO grows out of this effort. The list is an impartial amalgamation of the top face-to-face, real world conferences on the topic.